So, you've mastered the art (or should that be the science?) of building the perfect sandcastle. Now it's time to expand your beachside repertoire even further with the impressive skill of creating your very own sand sculpture. With the long summer days stretching out ahead, a day at the beach is still a low-key way of saving money on kids' activities and spending a day in the sunshine. Entertain yourself with a picnic, a dip in the ocean and the creative challenge of sculpting something spectacular out of sand, and before you know it you've had a zero cost day out for all the family. With our free budgeting software, you can keep track of your summertime savings and see how much you've got left over for that big night out or weekend getaway. What's more, you can see an easy-to-read graph charting your recent expenditure  which is very satisfying after a day or two of frugal fun. We all admire an ambitious artist, but it may be that a life-size model of Elvis Presley isn't the most prudent place to start if you've never made a sand sculpture before. Pick something fairly low to the ground, with a structure that is relatively stable, like another type of building (an igloo, church or cottage), a vehicle (a rocket, train or boat), or a type of animal. As we all know, wet sand is the best for building, and this is especially important when it comes to creating a base for your structure. Flatten the ground with your hands or a small spade, and then start digging up sand to pile on top of it. Once you've got a flat base with a mound of sand on top of it, wet it a little and form it into a raised layer with a slight berm, or ‘wall' around the edge. Pour another generous dollop of water on and immediately start patting down the foundation with your feet so you have something akin to a flattened hill of sand. Repeat until you have a firm, moist base for your structure. Cut out the base from a cheap bucket and rub the edges until they're smooth. Place the bucket on your foundation and add a layer of sand, which you'll then submerge in water. Repeat this process until you get a vertical body to sculpt. If you're aiming for a wider sculpture, experiment with placing two buckets next to each other and then merging the body whilst wet. 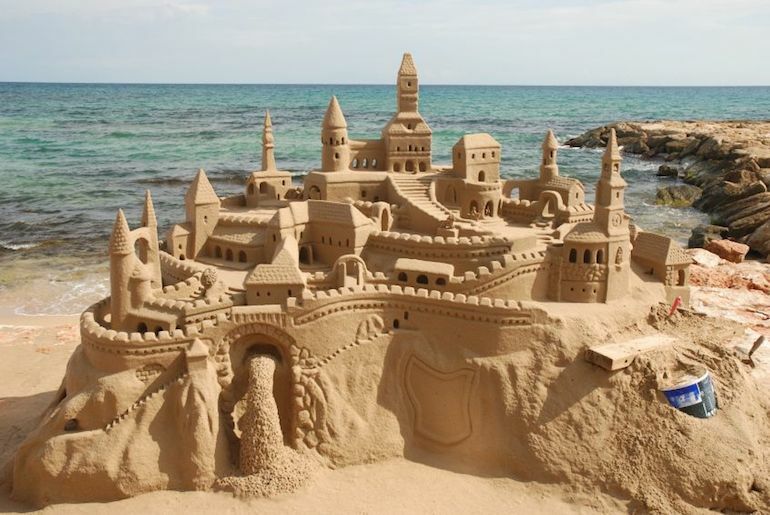 Be sure to condense the sand as you're stacking, as this will keep it firm enough to mould. Hand stacking is the method used by most sand sculptors. It involves taking a very wet lump of sand and moulding it into a patty with your hands, and then placing it on your main structure to add detail. You don't need to splash out on any specialist tools to sculpt with; spoons, brushes and garden trowels will do just fine. Just bring your creativity and enthusiasm, and you'll be well on your way to a spectacular sand sculpture.